ONE of the Federal Government's mobile service centres will visit the Derwent Valley next week. Essentially a large truck with a "pop out" office, the mobile service centre travels through rural and regional communities to provide personalised face-to-face access to information and services. 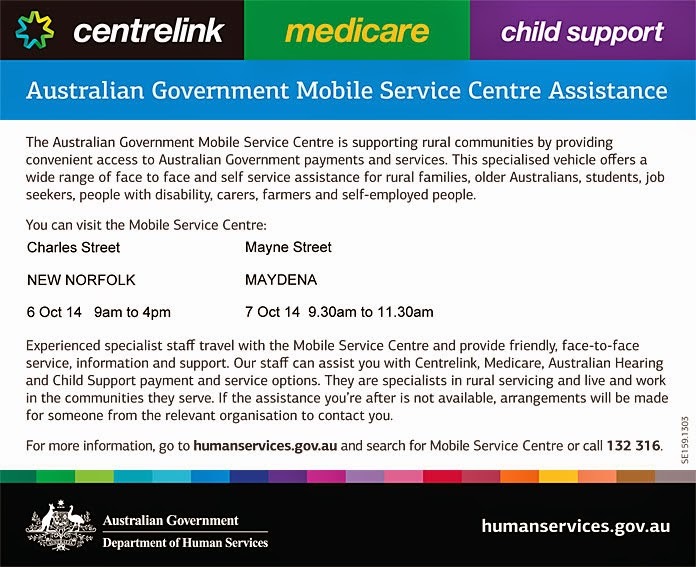 Staff on board the mobile service centres can provide information, assistance and support to older Australians, families, students, jobseekers, people with disability, carers, farmers, and self-employed people. NEW NORFOLK: Woolworths car park, Charles St, from 9am to 4pm on Monday, October 6. MAYDENA: Near the community hall, Mayne St, from 9.30-11.30am on Tuesday, October 7. OUSE: Adjacent to the Lachlan Hotel, Lyell Hwy, from 1.30-4pm, on Tuesday, October 7. HAMILTON: Hamilton Park, River St, from 9am to 4pm on Wednesday, October 8.